It’s going to be another great day for the New Albany Farmer’s market. The market is open from 4-7, come down and see what’s in season. 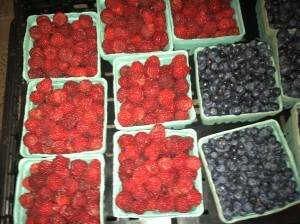 We’ll have a variety of berries…(see what we picked today) red raspberries, blueberries and black raspberries to be picked tomorrow. We won’t have a lot so come early to get your pick. We still have a few cool weather crops available; green onions, peas and radishes. But be assured there are plenty of summer crops available… tomatoes are here along with a few green beans! We also have cabbage, Swiss Chard, new potatoes, beets, zucchini, summer squash, green peppers and cucumbers. Kenny’s has some fresh dug elephant garlic! We will have some of our farm fresh eggs available, but they will be on a pre order only basis on Wednesdays. It’s just too hot to keep unwanted eggs in the cooler. Just let me know if you need me to bring some for you and I will be glad to accommodate you.